Add coconut cream and chicken stock to a large pot and bring to a boil over medium-high heat. 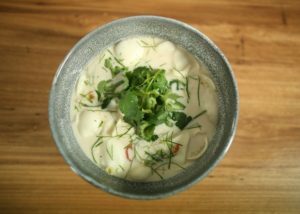 Add lemongrass, galangal, ginger, chilli and ½ of the kaffir lime to coconut broth. Reduce to a simmer and cook to infuse flavours for 5 minutes. Add cherry tomatoes. Add fish sauce, lime juice, palm sugar and a pinch of salt and mix through. Taste and adjust seasoning if required. Tear the mushrooms and add to the soup. Divide into serving dishes and garnish with remaining kaffir lime and coriander. Serve immediately.